It is once again New Comic-book Night. For 2-3 weeks each month, NCN doesn't require me to visit the comic shop, because either nothing I collect comes out that week, or else I buy the issues digitally. However, twice each month (usually weeks 2 and 3, although it can be weeks 3 and 4 in a month with 5 Wednesdays), I actually purchase new print comics on NCN. Yesterday was one such Wednesday. Also, in the past, I have been using NCN to pick up print copies of the third Supergirl series (Peter David's series about the Matrix Supergirl). With my recent completion of that collection, I had no individual back issues to purchase. However, I have begun collecting another Supergirl series -- series four, which ran for 67 issues from 2005 to 2011. Unlike the previous Supergirl series, series four was published during this modern era of "trade paperbacks," in which a series consists of story arcs lasting 5-8 issues (on average), and those story arcs are then re-printed a year or so later as a single paper-bound volume (the "trade paperback" or TPB). In many cases, buying TPBs is the most efficient way to read older stories. The TPBs are often more readily available than individual back-issues, and are frequently much less expensive. For example, a single near-mint copy of Superman/Batman 19 (which is the launch story for the fourth Supergirl series, then continued in Supergirl 1) can cost upwards of $8 on its own, while Supergirl 1-5 cost $4, $3, $3, $2.50, and $2.50 respectively, or $23 total. On the other hand, the TPB of Superman/Batman 19 plus issues 1-5 of Supergirl costs only $14.95. TPBs also save lots of space and are much easier to keep in good condition (because of their firm spines and their more durable covers). Therefore, at least for this first story arc, I went with the TPB instead of the individual issues. 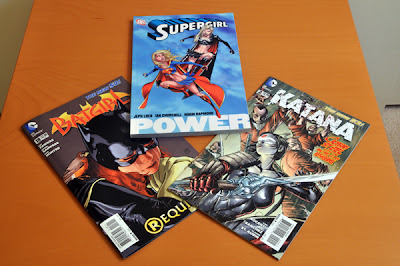 And so, for NCN this week, I bought two new comics - Batgirl 18 and Katana 2 - and one TPB - Supergirl: Power. I've already read the two single issues. Katana 2 was interesting. The art is a bit questionable in this series -- perhaps it's the inker's fault, but most of the panels look like they could use some additional "finishing." The story is fairly good and has me curious about what is coming next. I haven't decided to add this series to my long-term pull list just yet, but it's getting close. Batgirl 18 was a decent issue, but the writing is decidedly inferior to Gail Simone's. I'm hoping Gail will be back for issue 19, because this series loses a lot without her unique voice behind Batgirl. The other problem with the Batgirl series is the need for it to regain its own path and identity. Batgirl has been leading into, participating in, or leading out of, cross-family storylines for 6 months now -- #0 is the last issue that has been just a Batgirl story. It's enough already. Let's get back to some real stories focusing just on Barbara and her supporting characters. For instance, we haven't even seen her room-mate in three or four months. Again, I think this will be fixed once Gail returns -- at least, I hope so. I've also gotten about 2/3 of the way through the Supergirl: Power book. Although the overall plot is interesting, the writing is juvenile. The way all the superheroes just blindly attack not only Supergirl but even their friends without stopping to talk is simply absurd. I might, perhaps, be able to understand the "punch first and ask questions later" mentality when they go after a villain, especially a known villain like the Joker or Lex Luthor. But to behave that way with a girl you've never met but whom you have every reason to believe is a hero (and Superman's relative to boot) makes no sense. And to do it to your own fellow team mates (as the Teen Titans do to Superboy in this story) is simply inexcusable, no matter what they think about his powers being "out of control." I'm honestly rather surprised by this story arc, because I thought Loeb's writing was quite good in the Superman/Batman: Supergirl storyline that re-introduced Kara to the world. But the "Power" story arc is written like the kinds of stories I dreamed up when I was 10 (with lots of silly fights between heroes for no reason other than to just have fights). Hopefully the last 2 stories in the TPB will be an improvement.